Let’s step back a bit, and look at how the brain triggers cortisol production: through a peptide produced in the brain called CRF (corticotropin-releasing factor). CRF is elevated in several disorders such as depression and PTSD, and is also thought to be involved in drug and alcohol dependency. Neurons that make CRF are found in locations all over the brain, so studying them can be tricky. Kerry Ressler and his colleagues have developed an intriguing tool for studying CRF. In the places where CRF is produced in a mouseâ€™s brain, they can take out the gene of their choice. 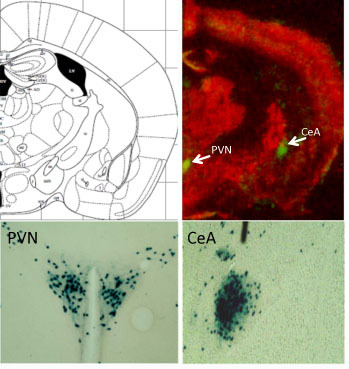 Green spots (above) and blue staining (below) indicate where CRF is produced in the mouse brain. In a new paper in PNAS, postdoc Georgette Gafford and Ressler use this tool in a subtle way. They have mice where a gene for a GABA receptor, one of the main inhibitory receptors (brakes) in the nervous system, is deleted, but only in the CRF neurons. This basically has the effect of turning up the volume on CRF production in several parts of the brain. It appears that modulating GABA receptors is something that normally happens to regulate CRF production, but in this case, a restraint on these stress-sensitive cells has been taken off. â€œThese mice are normal in many ways – normal locomotor and pain responses and no difference in depressive-like behavior or Pavlovian fear conditioning. However, these mutants have increased anxiety-like behavior,â€ Gafford and Ressler write. â€œThese data indicate that disturbance of this specific population of neurons causes increased anxiety and impaired fear extinction, and helps us to further understand mechanisms of fear- and anxiety-related disorders such as PTSD,” Ressler and Gafford write. Drugs that block CRF have been in clinical trials, some with mixed results.Â A trial now proceeding at Emory is evaluating a CRF antagonist in women with PTSD. Ressler, associate professor of psychiatry and behavioral sciences, is a Howard Hughes Medical Investigator, with a laboratory at the Yerkes National Primate Research Center. He is also co-director of the Grady Trauma Project.